Last night I had the opportunity to volunteer for a wonderful and worthy event and I also had a lot of fun in the process. I was reminded of the way I felt back when I volunteered for the World Pastry Championships in Nashville and of how great it felt to both be a part of an exciting event and to be around chefs and work with food. I've got to do it more often. 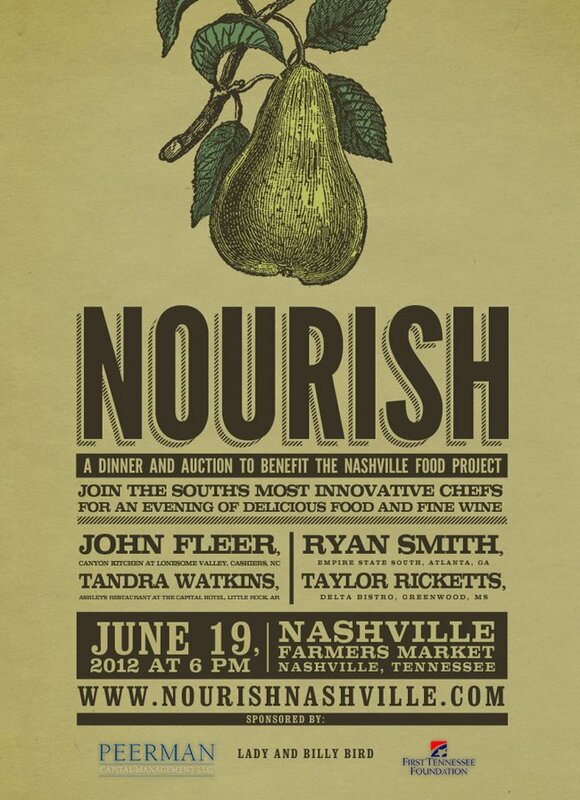 Last night's fun was a benefit that took place at our local farmer's market called Nourish Nashville. 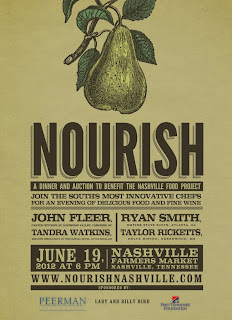 A benefit for the Nashville Food Project, it was a four-course dinner with wine pairings prepared by some of the best chefs in the Southeast followed by an auction. 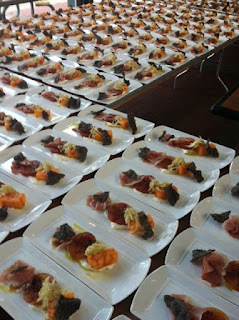 The dinner was sold out and at $160 a pop, it was a huge success. My role was to assist the (some of them James Beard Award nominee) chefs in the kitchen. When I first arrived there was a bit of confusion and not a lot to do. I saw some friendly faces, Cara and chef Hal, owners of the soon to be opened around the corner from my house (yay!) Lockeland Table. 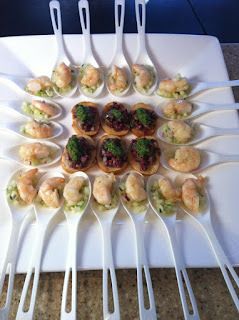 I jumped right in and helped plate the appetizers Chef Hal Holden-Bache was preparing: beef heart tartare with mustard green and peanut pesto, and pickled Gulf shrimp with cucumber mint salsa (photo above). Yum. After tasting these and knowing what these two are capable of, I cannot wait for their new venture to open. Then, there was some waiting and standing around while the MC (none other than esteemed Southern food expert and journalist, John Edgerton) talked about the cause and introduced important people. In the kitchen the man who seemed to be in charge, or at least the one everyone looked up to, was Chef John Fleer (of Canyon Kitchen at Lonesome Valley in North Carolina but known formerly as the man behind Blackberry Farm, one of my all-time-would-die-to-eat-there-let-alone-stay-there places in the world). I was equally impressed by him and by his calm and courteous demeanor. He even thanked the volunteers for being there (before we even did anything). (the first course: tomato terrine, Empire State South Fromage Blanc, bread crakers, country ham, fennel and Georgia olive oil, prepared by Empire State South (Atlanta) chef Ryan Smith. 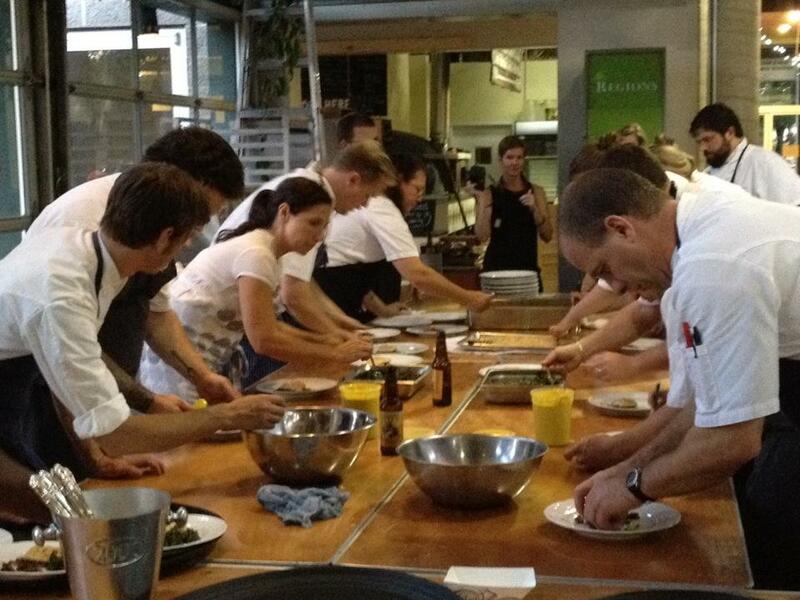 Each chef was responsible for one course and as the tables were lined up and the chefs and their assistants started stacking plates and getting their ingredients ready, it became a joint effort and it took every set of hands from every chef or volunteer to get the 250 + plates ready to go out. Once the course was plated, it was picked up by the servers and whisked off to be devoured by guests seated just beyond the flimsy curtain that separated the kitchen from the makeshift market hall dining room. I wanted to be a part of the energy even if just as a bystander so I stood nearby watching as they readied the first course. 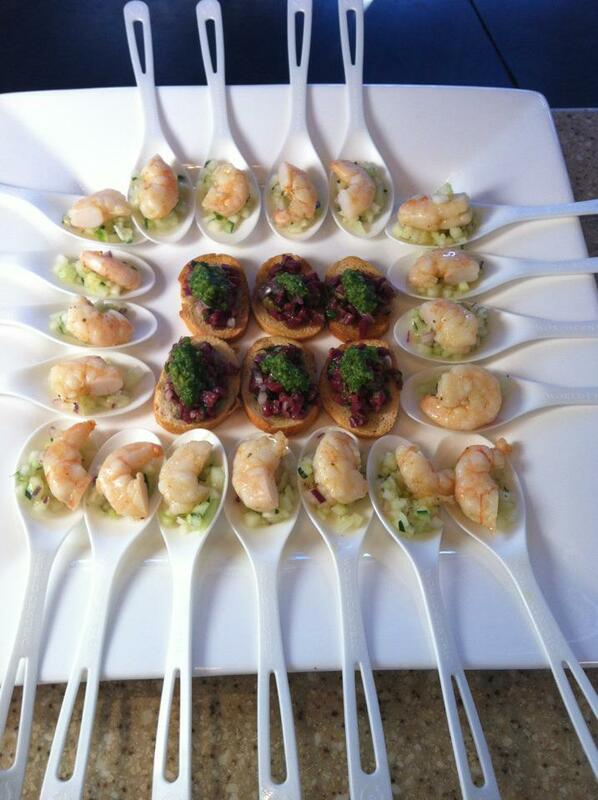 I never thought that I'd be asked to jump in and help plate this delicious and complicated-looking food. But when a chef motioned for me to jump in the line, I didn't hesitate and my job was to carefully place a little mound of chili-braised Tuscan kale alongside the crusted Sunburst trout and rum-sorghum glazed pork belly--the second course-- prepared by none other than Chef Fleer himself. I tried not to falter and work as fast as everyone else was working and it really was a well-oiled assembly line of quick hands and sliding plates. Wow, it was fun. (there I am in the middle, looking very serious). The third course (prepared by Taylor Ricketts of Delta Bistro in Greenwood, MS) looked amazing and it was all I could do to not visibly drool while I stood there sprinkling the shaved almonds on top of the mound of buerre noisette-poached rabbit saddle roulade over burrata risotto, with pear confit, fried sweet potato greens, acacia honey with dried fruit and almonds. (Whew). It took about as many people to plate as it did words to describe. Chef Hal, who was working next to me, handed me a bite of the rabbit after we were done and it melted in my mouth. The final, dessert course looked mouth-wateringly good too and I did get to try that one at the end of the night, sharing a leftover plate with another volunteer. It was prepared by Tandra Watkins of Ashley's Restaurant in Little Rock, AR and it was a blueberry and buckwheat upside-down cake with coriander cream. Oh. my. goodness. It was ridiculous. That was fun to plate because we all just walked around the tables randomly setting the little cakes on top of the triangular-shaped plates with drizzled blueberry sauce and then spooning (or "quenelle-ing" -is that a word?) the cream on top of each one. 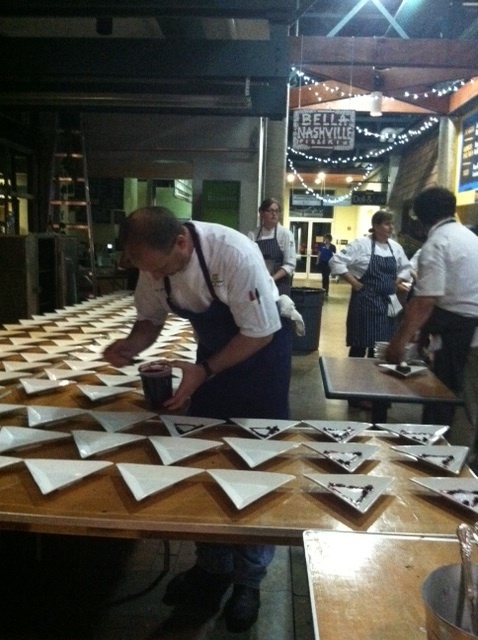 (here is Chef John Fleer getting into helping out by drizzling blueberry sauce). At the end of the night, I drank a spot of bourbon with the other chefs and then headed out, a quart-sized mason jar of mustard green pesto under my arm as a gift from Chef Hal, tickled pink with myself and vowing to volunteer for another event like that as soon as I could. Thanks to my friend Amanda Dixon for sending the opportunity my way. I'm not sure how to begin to talk about all the stuff that has happened in the last month. It seems like so much longer since I posted on the old blog. So I won't even try. Suffice it to say that life happened, in all its joyous, sad, challenging and crazy moments. Nothing I can't handle, but lots of things that have interrupted the normal course of days and weeks and routines I like to keep. Like writing on the blog. So I decided to just get back into it by way of a few memorable meals I made and enjoyed lately. None of these were super elegant or exciting or even memorable because of the food. It was the people I shared them with that made them special and the happiness that was created because we sat down together. The second party only a week later was a paella dinner for about 12 people in honor of some neighbor friends who I got to know only recently and wish I could have shared more meals with. Both of them love to cook and so we had a collaborative dinner party which meant no one person did all the work and the result was a gorgeous and tasty paella that was loved by all, even the littlest among us. Tres leches cake (again) was the dessert of choice. I used Alton Brown's recipe both times which is super easy and so decadent. While making it twice was no problem, I don't recommend eating it twice in one week. Anniversary dinner at the beach with Daniel. At the end of April our little family took a vacation. We were lucky to be offered the home of some friends--a house on the beach in Santa Rosa, on the Florida panhandle. It had been five years since D and I had been to the beach, and it was June's first time ever. Needless to say, we had a blast. We ate most of our meals out during that week just so we didn't have to work much. But one day we found a great seafood market and bought a bunch of local delicacies and did it up, in honor of our first anniversary. We put the baby to bed and started cooking. We snacked on little tiny clams that Daniel harvested on the beach, lightly steamed in olive oil, garlic, lemon and parsley. That was followed by fresh, raw Apalachicola oysters and lots of crisp Sauvignon Blanc. Then I made linguine 'frutti di mare' with shrimp, clams, scallops and fresh tomatoes and garlic. Perfection. And of course, one of my favorite desserts: Florida key lime pie. Last-minute Sunday pasta dinner. This last Sunday we had had a hard week and were just needing to relax. 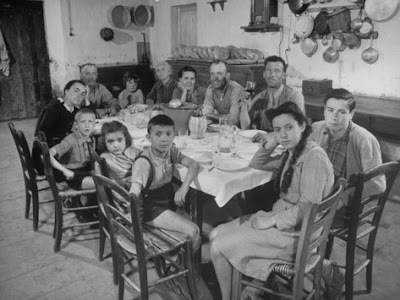 In my family growing up my mom always cooked pasta on Sundays and I carried that tradition into my relationship with Daniel in the early years. Now that we have a baby nothing is that regular anymore, but we still sometimes crave pasta on Sundays. My friend Stacia, who I love and don't get to see that often, was in town and I invited her to join us. I had everything I needed in the pantry and so didn't have to go to the store for anything, which is nice. I made a sauce with sausage and red wine, red pepper and garlic and served it over strozzapreti - the little twisted shape from Puglia that catches the sauce and always goes well with a meat sauce. A simple salad with store-bought dressing and red wine rounded out the meal and it was nice to just enjoy a simple and satisfying comfort dish with loved ones. Corn and early summer dinner outdoors. The weather has been alternately really hot and oddly cold this spring and early summer. So tonight we ate dinner outside for the first time because there was a nice breeze and the bugs seem not to have arrived just yet. All we ate was grilled corn on the cob, a fresh tomato and arugula salad and bread. But the corn was deliciously sweet and tasted just like summer and it was beautiful to watch June devour it with such joy and two-year-old abandon. I could have eaten her up she was so cute. Too bad I didn't get a picture. (The one above is of her the very first time she ever tried corn on the cob - in a Mexican restaurant -it was love at first bite). Taken together, these meals don't have much in common except the pure and simple joy that comes from cooking and sharing meals with the people I love. Anything and everything, good things and bad, can be happening all around me but if I can just slow down enough to cook something simple and share it with my family and friends, I know I'll always be okay.